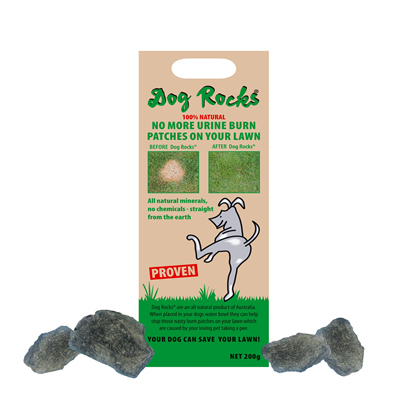 DOG ROCKS Dog Rocks are an exciting and proven product used to help prevent those nasty burn patches appearing on your lawn when your loving pet takes a pee. You may find that in times of extremely sunny weather and high temperatures your dog will drink more water. In these circumstances you may find that you will have to “up” your dosage of Dog Rocks and in some cases even double it. Dog Rocks are not an exact science and every dog is different but once you have sussed out what works for you, there is no reason for any more burn patches on your lawn as long as directions for use are adhered to.